Magnificence, royalty & splendor: “The Baroda Pearls”, one of the priciest pearl necklace in the world! 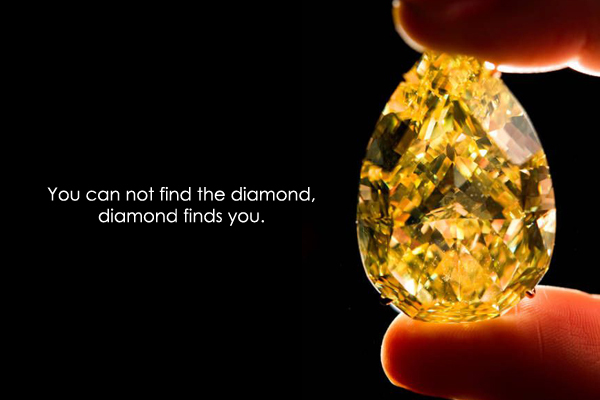 Perfection, mystery & elegance, the legendary Baroda Pearls, one of the most important & expensive pearl necklace. This magnificent reconstituted natural pearl necklace is strung with 68 of the largest & finest pearls from the famed 7-strand natural pearl necklace that formed the cornerstone of the Royal Treasury of the Maharaja of Baroda. Pearl necklaces of such important size, quality, signature & provenance rarely appear on the market. The necklace originated in the mid-19th century, the most possible sources of the Baroda Pearls are the Persian Gulf, the Red Sea & the Gulf of Mannar, the hub of the international pearl trade since ancient times. The exceedingly rare & historically important pearl necklace, symbolic of a bygone era of Indian splendor. ''The Baroda Pearls'' have been coveted throughout history, & its appearance at auction represents a monumental event for jewellery collectors & connoisseurs worldwide. Worn through the centuries & across generations by the Indian Maharajas of Baroda, this supreme necklace has been documented endlessly as the epitome of elegance, extravagance & rarity, sentiments embodied by the powerful & endearing Gaekwars of Baroda. In India, pearls were treasured most among all other gems & was used prolifically, adorning the magnificent royal dress of the Maharajas of India & woven into ornate decorative objects. Over the centuries, the Maharajas were known for their lavish taste & ornate decorations, which would reach near mythical proportions. Their desire for vast quantities of pearls to adorn their crown jewels was limitless. Word of their boundless riches & luxurious taste spread promptly & some princely families began to make headlines, most notably the Maharajas of Baroda. This extraordinary 2-strand pearl necklace consisting of 68 natural pearls was originally a part of the famous 7-strand necklace that belonged to the Maharaja of Baroda. 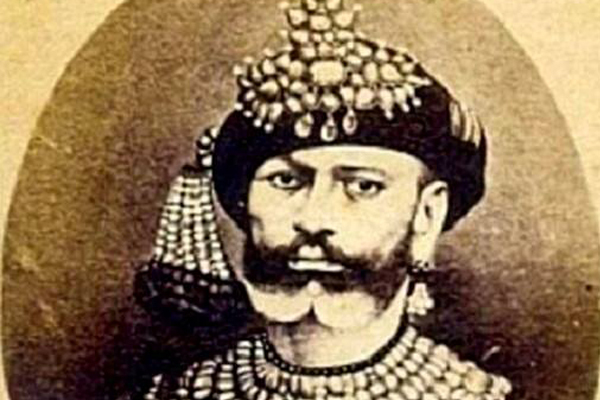 The orignal necklace that was commissioned by Maharajah Khande Rao Gaekwad during the his rule of Maratha Kingdom of Baroda (r.1856-1870), was made up of 7 strands of matching pearls in terms of size, shape, colour, luster & surface quality. 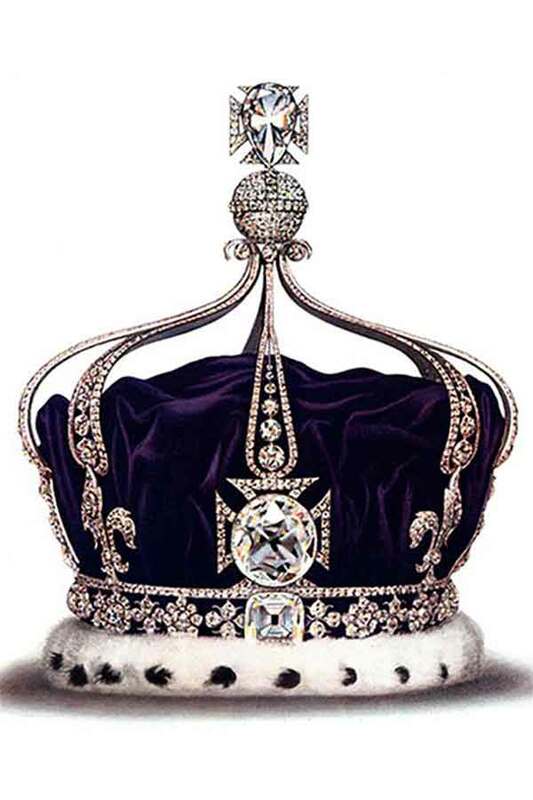 It was handed down to Sita Devi, the then Queen. While maost of the crown jewels of Baroda were carried to the residence of Maharajah Pratapsingh Rao in Monaco & sold before India gained independence from the British in 1947, this pearl necklace was finally back again & remained within the family. The necklace was now reduced to 6 rows, from its original 7. It's unknown whether it was the shortest or longest strand that was missing. 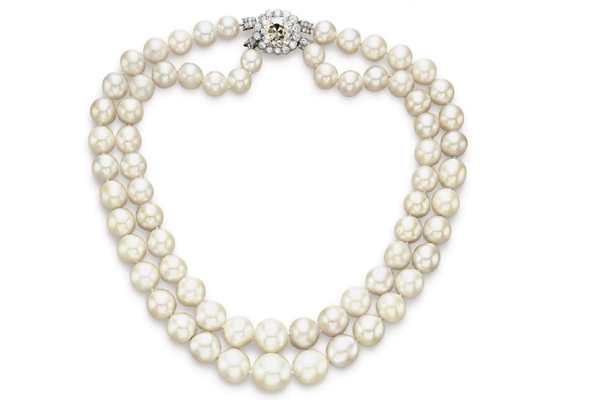 The fate of the necklace since then was unknown, but a 2-stranded pearl necklace restrung from selected pearls of the original necklace appeared at a Christie's N.Y. in 2007. The 7-strand pearl necklace became world famous when a photo of the 12th Gaekwad Maharajah Sayaji Rao III, wearing it appeared in the "Book of the Pearl" published in 1908 by Tiffany's gemmologist George Frederick Kunz who described the Baroda holdings as ''among the greatest jeweled treasures of India'', & came to be known as the "Baroda Pearl Necklace." The last Gaekwad Maharajah, at the time India became an Independent republic, Maharajah Pratapsingh Rao Gaekwad, who ruled between 1939 & 1951, the necklace again aroused attention, when the Maharajah was photographed by Henri Cartier Bresson wearing it. Each pearl luminous strand radiated elegance, wealth & power, this necklace was among the most expensive pieces in the Baroda Royal Treasury & remained one of its prized jewels throughout the 20th century. most important pearl necklace in the world,'' said Christie's. "The Baroda Pearls Necklace" is a combination of perfect quality & royal provenance that something never witnessed in the history of jewellery before, made it one of the most expensive pearl necklaces in the world to date. ● Referred to as "The Baroda Pearls", this legendary 2-strand Baroda pearl necklace, made of 68 graduated natural pearls (9.47 to 16.04 mm), all impeccably matched in colour, luster, size & shape, & jointed by a stunning 8.57-ct circular old mine cut diamond & platinum foliate clasp, mounted by Cartier. The necklace is assembled from the original 7-strand pearl necklace owned by the Indian Maharajas of Baroda, once was part of the Baroda treasure dated to the Mughal times. ● A pair of ear pendants, each suspending a drop-shaped pearl, measuring approx. 13.34 - 15.08 x 22.26 mm & 14.40 - 15.01 x 21.05 mm, within an old European & old mine-cut diamond surround, to the button pearl surmount, each measuring approx. 12.56 - 12.62 x 10.85 mm & 12.31 - 12.76 x 9.28 mm, within a similarly-set diamond surround, mounted in silver-topped gold. Necklace clasp signed Cartier. ● A brooch, set with an oval-shaped pearl, measuring approx. 17.17 - 19.16 x 15.09 mm, within a bezel-set old European & old mine cut diamond foliate surround, mounted in platinum. ● A ring, set with a button pearl, measuring approx. 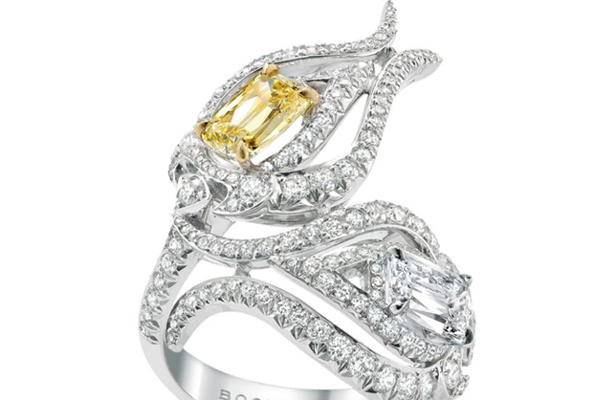 14.62 - 14.90 x 13.52 mm, flanked on either side by graduated baguette-cut diamonds, mounted in platinum, with French assay mark. 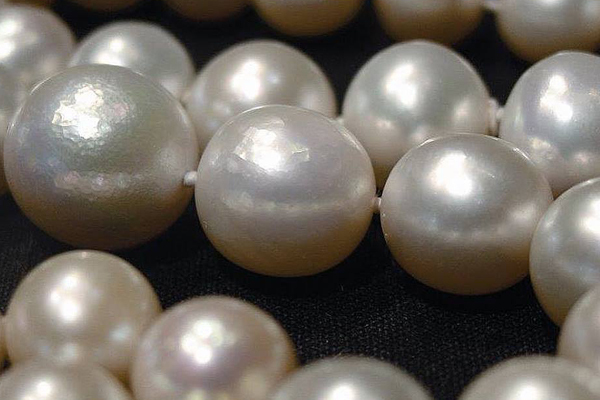 Gübelin states that the 2-row necklace consisting of 68 graduated pearls are natural. The 2 button pearls & the 2 drop-shaped pearls are natural. The oval-shaped pearl is natural. The button-shaped pearl is natural. A close up of the Baroda pearl necklace, which was sold at N.Y. 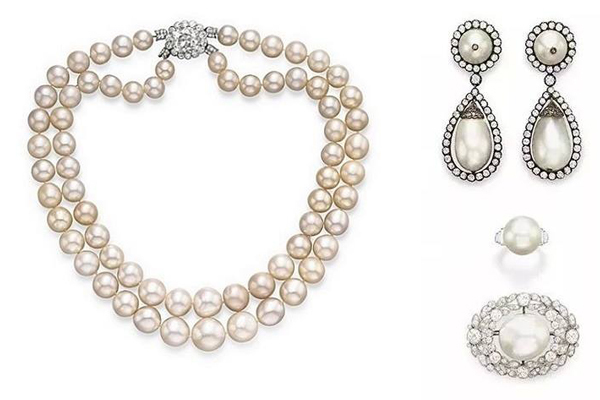 Magnificent Jewels sale in April 2007 for $7.1 M. It set a world record price for a pearl necklace, the highest ever achieved by a pearl necklace at auction. 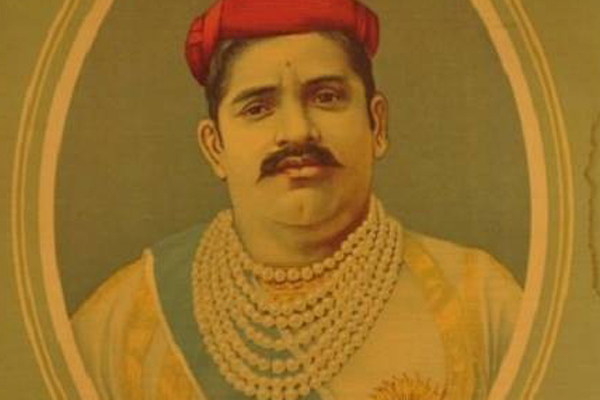 Maharajah Gaekwad Khande Rao (1856-1870), during whose reign the original Baroda Pearl Necklace was commissioned. 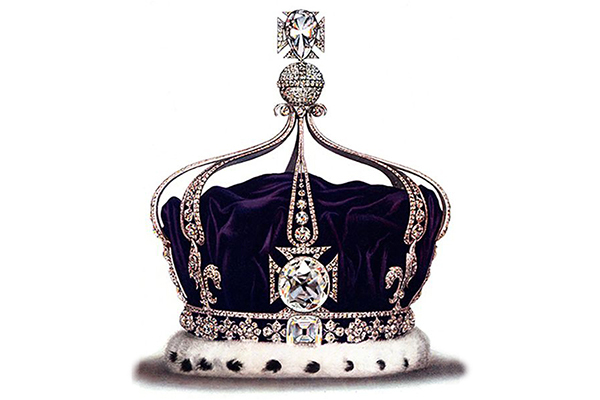 Considered to be one of the greatest jewellery collectors in the 19th century, Maharaja owned an unparalleled collection of crown jewels. One of the most extravagant piece was an extraordinary necklace composed of 7 strands of perfectly matched & graduated natural pearls.